These days we’re pretty used to seeing maps designed to accommodate a wide range of user circumstances including colour modifications for those who perceive colour differently or the use of audio to provide a narrated map. There’s also a small but important research area that encompasses tactile mapping for people who have limited or no sight at all. 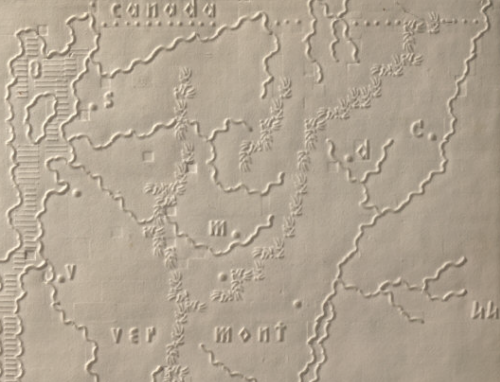 This map is regarded as the first to be made that was specifically designed with blind people in mind. Quite simply, all we know about cartographic design in terms of standard visual variables goes out the window. 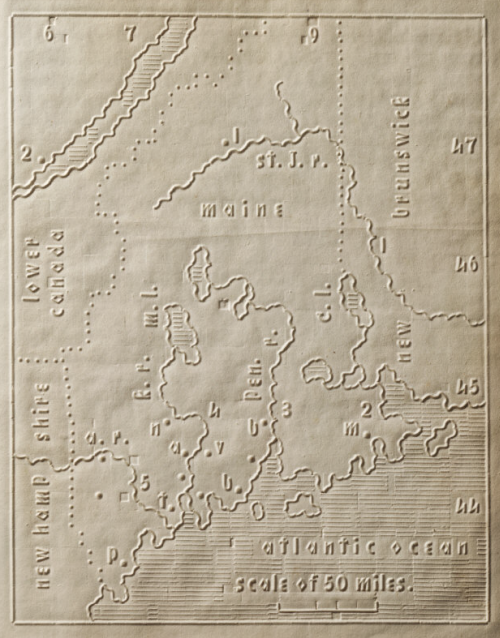 Samuel Howe designed this atlas, comprising maps of 24 US states with a page of text accompanying each, for children at the New England Institute for the Education of the Blind in Boston. 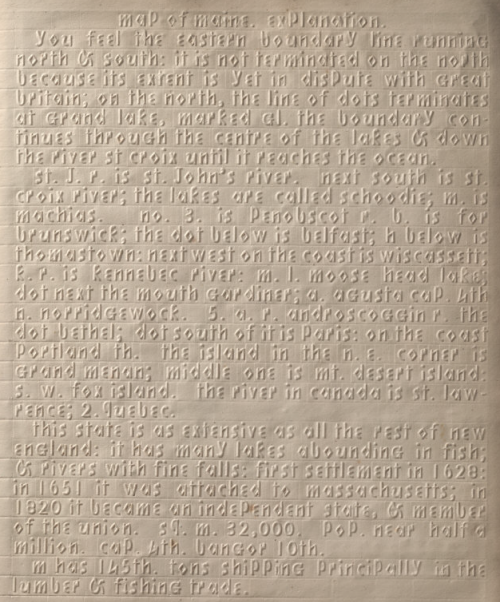 The medium was a heavy paper stock and every line and mark, symbol and piece of text was embossed. While braile was invented some 12 years earlier it wasn’t capable of representing even simple, let alone complex, cartographic symbology. Lines take on different shapes and forms for different features and numbers and letters are used as symbols to locate places, each of which is expanded on and shown in the accompanying text. While clearly the amount of detail one can include is heavily constrained by the technology and also the fact that recovery of detail is through the fingers, Howe did not sacrifice basic map components such as latitude and longitude and scale. 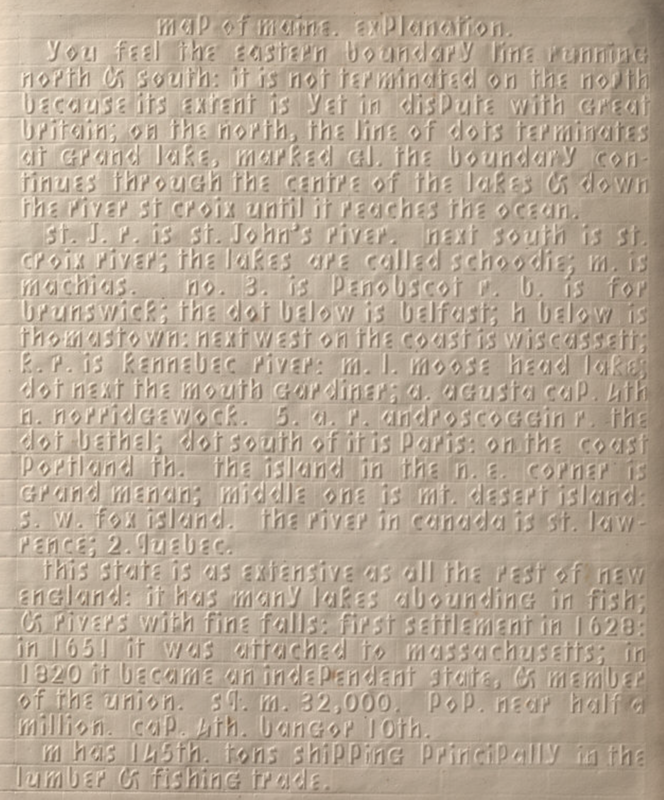 Water has an embossed fill and mountains are shown using a series of short lines, not unlike a heavily generalised hachure effect. The atlas was used as a geography teaching aid and the children could learn where boundaries of countries, roads, mountains and a range of points of interest lay. 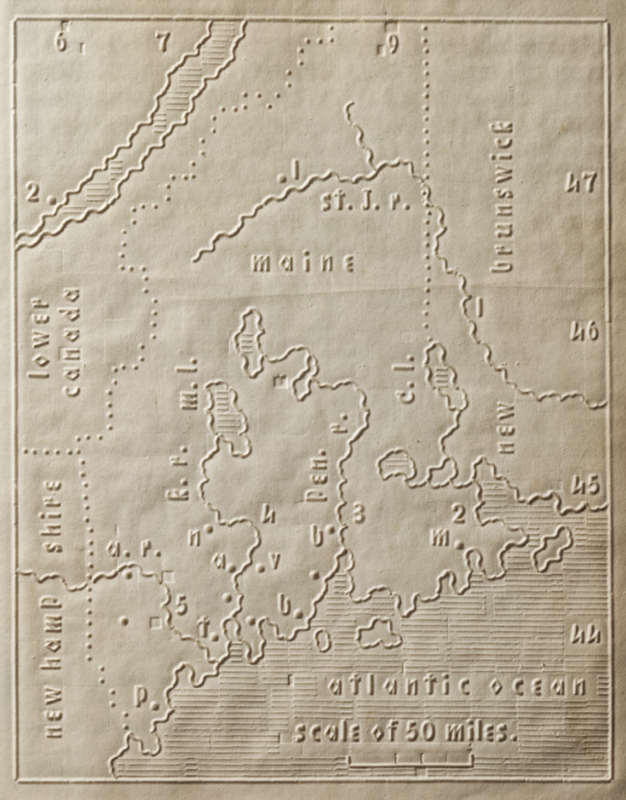 While braille took over for communicating words, Howe’s maps still provide a clear lineage to maps made in a similar style today. The techniques used today tend to follow the same as the production of heat-moulded relief maps using a plastic sheet. 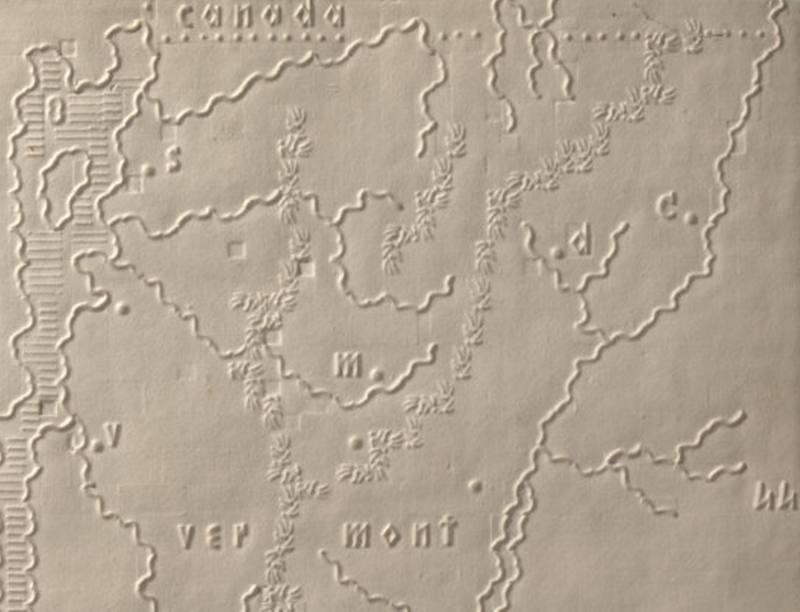 Conceptually though, features are still commonly embossed on maps for the blind. A great example of making a map for a very specific user and dealing with design in a way that accommodates the constraints the user faces. This entry was posted in MapCarte and tagged blind, historic, MapCarte, tactile by @kennethfield. Bookmark the permalink.